COVE team members helping at Crayons to Computers in Bond Hill. HCJFS employees are helping out in the community. 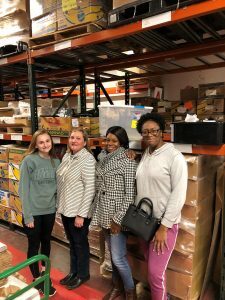 A volunteer team of employees started the Community Outreach Volunteer Effort (COVE) to connect with the community through volunteer activities and events. COVE members believe that volunteering will be a positive and collaborative experience for employees from all sections of the agency. If you would like to request help from COVE, fill out this form. Use this form to request assistance from HCJFS' Community Outreach Volunteer Effort - COVE. What organization needs COVE's help? Who should COVE contact to offer help?